There is an age-old adage that says, the world always looks brighter from behind a smile, a philosophy Dr. Mahesh Patel shares with his many patients at his dental clinic Your Family Smiles in the Logan Square community. Dr. Patel is a member of the Chicago Dental Society, American Dental Association, Academy of GP Orthodontists, and International Association of Orthodontists. 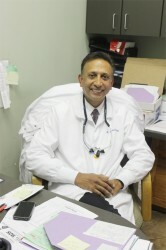 Dr. Patel welcomes new patients to his clinic for free consultations and free exams. Your Family Smiles is located on 4355 W. Fullerton. For more information, visit www.yourfamilysmiles.com. “I enjoy all aspects of my job. I love helping people and I love working with them to create better solutions that will keep them smiling,” said Dr. Patel. Be sure to check out our paper for an exclusive coupon for any Your Family Smiles service. © 3181 Chicago Hispanic Newspaper, Lawndale News, Hispanic Bilingual Newspapers, Su Noticiero Bilingue. All rights reserved. XHTML / CSS Valid.